DACHIC Hair-Trustworthy Hair Brand. More than 20 Years Human Hair Manufacturer. Brazilian virgin human hair cut from healthy donor, clean and soft, no lice, no synthetic hair mixed. No shedding, No tangles, Full cuticle. Double machine weft makes strong structure. Silky and shiny hair shows natural look and makes you more attractive. Easy to care and curling iron safe. You can dye, bleach, curl, straighten and restyle hair as you like. Can last about one year with good care. 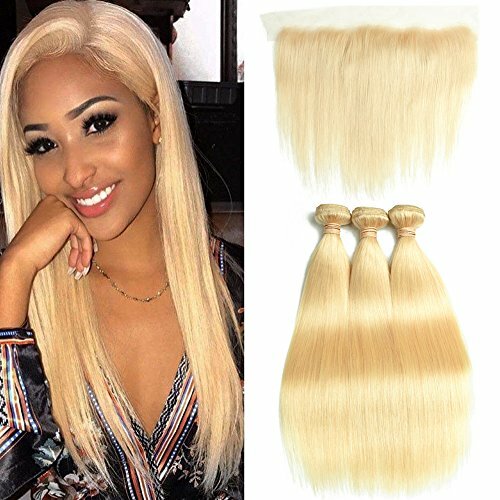 # 613 Blonde Hair, 95-100g/bundle (3.3-3.5oz/bundle), 12-24 Inch in stock. Lace Frontal 50-85g, lace size 13x4 inch, 130% density, bleached knots. 30 Days Money-Back Guarantee. No Reason Return or Exchange. You Have No Risk To Try. 3-5 workdays to USA by FedEx.